Since its screening at 1993, Harold Ramis's "Groundhog Day" has been a source of inspiration for a number of films. Cho Sun-ho however, in his debut, decided to adapt to the Korean standards, to take it a bit further, and in the process, to present a new perspective on the "repeating day" concept. Jun-young is a celebrated surgeon working in third world countries, who abandoned a prestigious job at a hospital to do so, after his daughter, Eun-jung, survived an almost terminal illness three years ago. His decision however, has alienated him from her, since is quite frustrated with her father's neglect. 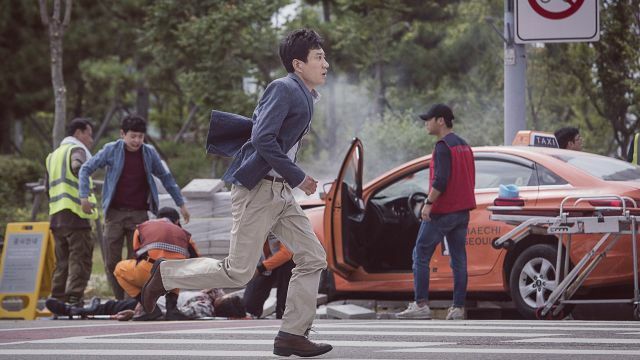 As Jun-young is on the way to meet her and celebrate her birthday, he stumbles upon an accident on the road involving a taxi, and decides to help. What he finds out soon, though, is that Eun-jung was killed in that same accident. Furthermore, and to his surprise, a little later he wakes up again in the beginning of his day in the airplane that brought him to Korea. As he tries to change his path in order to save his daughter, he realizes that he is not the only one whose day is repeated and soon finds himself cooperating with Min-chul, an ambulance driver whose wife was involved in the same accident. During their efforts, a number of secrets come to surface. Cho Sun-ho takes the concept of the "Groundhog Day" and transforms it into an agonizing and very dramatic thriller, through the theme of a father witnessing his daughter's death repeatedly and a husband his wife's, in the case of Min-chul. This aspect enhances the agony even more, despite the fact that it also induces the movie with a sense of melodrama, which, occasionally, is a bit excessive. The solution Cho presents becomes obvious after a fashion, commenting on the fact that a man has to look at himself before he looks at the events in his life, but the story arrives there after many twists with a build up that retains the interest for the whole time. Occasionally, I felt that the script goes a few steps above the measure, but since the movie involves fiction elements, this choice actually seems logical, at least for its largest part. The general sense of agony as the true story unfolds benefits the most by the exceptional editing of Shin Min-kyoung, who manages to keep a recurring scene interesting for the whole duration of the movie, through some very smart placed cuts. In this fashion, the rapid pace of the movie does not slow down much, except from a few scenes, in a tactic that benefits the general aesthetics of the production. In general, the visual aspects of "A Day" are impressive, with Kim Ji-yong doing a great job in the cinematography of the urban environment the story takes place, while the special effects by Hong Jang-pyo present the recurring crash scene impressive, despite the many repetitions. Kim Myung-min gives a more than adequate performance as Jun-young, highlighting his character's drama and agony, although he does not escape the clutches of the melodrama, occasionally performing in hyperbolic fashion. The same applies to Byun Yo-han, whose role is even more dramatic. I was very impressed by little Jo Eun-hyung, who plays Eun-jung, and already seems to have the air of a star. "A Day" is a very entertaining film, which manages to overcome its melodramatic elements by presenting a unique take on the "Groundhog Day" and through impressive production values.